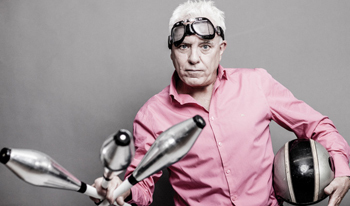 Farnworth-born comedian Dave Spikey visited Middleton, north Manchester this evening as part of his latest stand-up comedy show tour, Juggling on a Motorbike. My previous knowledge of this self-confessed veteran comedian was as a team captain on the TV show 8 Out of Ten Cats, and little else, and so I was curious to see exactly what he would be like live. Veteran he may be, but in the absolute best of senses. His lovely down-to-earth manner and chatty style was genuinely a surprise and enjoyable; and if they say that timing is the most important thing in comedy, then Spikey has this gift in abundance. Every joke was delivered with immaculate timing and aplomb, and his material very funny indeed. I have seen many comedians live over the years and cannot remember when I last laughed as much as I did this evening. Spikey had obviously put a lot of thought behind the show and what material to present and how. The premise of the show being that he was celebrating 30 years as a comedian. Through the course of the evening he related anecdotes of his life from his school and formative years growing up in Bolton, to finding his first job working in a lab in Bolton Hospital, to him becoming a comedian and writer, to working with Peter Kay on Phoenix Nights, to the present day. It was, if you like, a whistle-stop tour of Spikey's life. He started his showbiz career by winning 'Stairway To The Stars', and so to top and tail his show this evening he told the two jokes which he did then 30 years ago to get him a place on the first rung of the comedy ladder. The latter of these being a very visual joke entitled, Juggling on a Motorbike, hence the title of the current tour. Spikey tells of his childhood, speaking with nostalgia; which he tells us, is something that is remembered with rose-tinted glasses. He finds comedy in nursery rhymes, vocal faux-pas, the late great TV chef Fanny Craddock, the phrases and idioms that his parents would come out with, and remembers with great fondness his grandfather. His grandmother on the other hand was a formidable woman who used to scare him saying things like, 'There is only an L that turns a stranger into a strangler'. Life was simpler back then, without computers and technology, when kids used to find their own entertainment in the backyards and streets, but somehow he managed to, despite his hatred of maths, get himself into Grammar school and study to be a scientist. The comedy takes on a rather serious note here as he tells of how he had to kill guinea pigs and mice in his laboratory at his first job working in the TB lab at Bolton Hospital. He is today, and was then too, a massive animal lover, and now has a rescue and foster centre for animals which he runs with his wife. He told of his comedy influences in his life. In particular a friend and colleague of his called Derek Rigby, and a nurse at Bolton Hospital called Abigail Todd. His colourful painting of these two people was a delight and I really do hope it is true that he was able to get them together on a blind date of his arranging! Spikey also likes to find humour in newspaper articles and headlines and has kept newspaper cuttings from many papers throughout the years, and at the start of each act this evening he read out a few of his favourites. Finishing of course with his Juggling on a Motorbike stunt and a final super anecdote, this proved to be a highly enjoyable evening in his company. One more thing in his favour too; he didn't rely on a warm-up artist, instead commanded the stage himself the whole evening. Sadly one evening just wasn't long enough, and I will most certainly be going along to watch this consummate performer again.